In what promises to be the start of a Queensland bus industry tradition, the Queensland Bus Industry Council’s Christmas race day at Ipswich Turf Club on Friday December 16 was a resounding success, attended by 120 VIPS representing each facet of the industry. 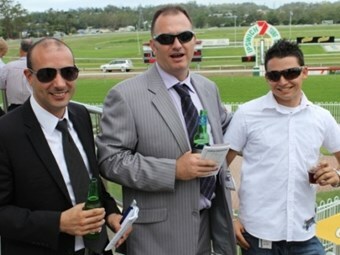 The QBIC race day was hosted by Bus Industry Confederation Chairman Wayne Patch, who also happens to be Chairman of the Ipswich Turf Club. Patch was delighted with the support from the local bus industry for the event, saying that QBIC guests at the function reflected the whole industry, not just operators or suppliers, and that the mix of attendees strongly supported BIC’s view that the industry is a large extended family, working and celebrating together. Among the ‘who’s who’ of attendees included Greyhound Australia COO Tony Hopkins, Queensland Thermo King General Manager Anthony O’Donnell, and Southern Cross Transit’s Frank Oliveri. Although many attendees travelled from various parts of Queensland for race day, at least one race goer – ABCU executive Thea Hillier – travelled from Melbourne for the event. Representatives from Higer, HVA King-Long, Scania, Transport Seating Technology, and a host of other suppliers joined leading Queensland operators including Brisbane Buslines, Clarks Logan City, Kangaroo and Caboolture Buslines, and Cavbus – each turning out in support of QBIC. Transport to and from Ipswich Turf Club’s Bundamba racecourse was provided by the Pulitano Group’s Bus Queensland. QBIC Executive Director David Tape says the event was strategically staged as part of the council’s push towards its annual conference in April, tied to the theme ‘Communicate, Connect, Create’. Tape says the event was for everyone connected to QBIC’s membership to celebrate the end of the year, and lead into the theme of the 2012 conference. "It’s all about communicating and connecting with each other, and creating the opportunities for growth and advancement in our industry," he says. Tape wasn’t sure how the race day would pan out during the planning stages. "Once we agreed to try something different it was all systems go, planned well by the secretariat and came off very well," he says. Insurance brokers OAMPS sponsored the lunch, lucky door prizes, and – significantly – the ‘best dress race wear’ prizes for male and female guests, with Bundy Buses Principal Fiona Hayes winning best dressed ‘filly’ and ABC editor, yours truly David Goeldner, as best dressed ‘stud’. It was a winning day all round, with Race 5 sponsored by Strategix, won by 4yo gelding Sir Stanley ridden by Melbourne Cup winning jockey Chris Munce, followed by the Zupps-Higer Handicap won by late starting emergency Flagges Flying, and then seeing Munce return to ride the winner of the Queensland Bus Industry Council Handicap on Hidden Babe. Tape thanked Wayne Patch for hosting the event as Ipswich Turf Club Chairman. "It was through Wayne the idea to hold a race day event was born." Tape says he would like to establish outcomes from social events held each year. "We want people to start getting used to the 2012 conference theme, so when we step into the conference in April everyone is aware and familiar with where we are heading," he says. QBIC’s ‘Communicate, Connect, Create’ conference and exhibition will be held at the Gold Coast Convention and Exhibition Centre from April 2-4, 2012.